Developed more than 30 years ago in Europe as the answer to the most demanding industrial environments, UCRETE® technology is the original polyurethane flooring solution that provides a powerful layer of protection for both new and existing concrete surfaces. UCRETE® stands out from the rest with a higher resin content that needs no additional sealer coat, which can wear away in time, leaving a floor porous and unprotected. Engineered as a superior alternative to acid brick, quarry tile and coatings, UCRETE® offers unequalled resistance to physical abuse, moisture, a wide range of aggressive chemicals and bacterial growth, outperforming traditional epoxy flooring surfaces in both impact resistance from heavy traffic and ability to withstand thermal shock. The technology and the application technique have been perfected with years of experience. Surface Solutions is a recipient of the prestigious BASF Performance Flooring UCRETE® Master Contractor Award for seven consecutive years and counting –an honor bestowed to only a select few flooring contractors and a testament to the hard work, depth of knowledge and high standards of our consultants and installation teams. Our UCRETE® Product Selector Guide can help you find the ideal product for your facility. Ideal for coolers, freezers, waste-water treatment plants, chemical production and processing facilities, paper and pulp mills, restaurant kitchens, pharmaceutical facilities, dairy, poultry, meat and food warehouses and plants, construction projects or flooring in need of repair. UCRETE® HP -a solid color flooring system- and HP/Q -a quartz multi-color decorative flooring system- are broadcast aggregate used to add texture to the flooring surface with an easy two-step application. Durable, slip-resistant, free of solvents, both are able to withstand fluctuating temperatures and can be applied to 7- to10-day-old concrete, limiting downtime. Ideal for interior applications, canning, bottling and other food packing facilities, refrigeration and freezer storage areas, restaurants and other commercial food production facilities, pharmaceutical laboratories, dairy, poultry, meat and food warehouses, facilities that require hot water and steaming during the cleaning process, areas where moisture is constant or flooring in need of repair. Ideal for exterior and interior applications, old concrete, dairy, poultry, meat and food plants, storage areas, commercial freezers, pharmaceutical labs, precious metal refineries, textile warehouses, chemical manufacturing and places that make use of other UCRETE products. UCRETE® IF (Iron-Filled), an iron aggregate, heavy duty, polyurethane hybrid flooring system, has a proven track record for providing long-lasting durable floors, especially in the harshest work spaces of heavy engineering workshops and processing areas, under mixing heads, in storage bunkers and loading docks and heavy equipment maintenance facilities. It is ideal for industrial environments, providing a high level of impact tolerance and abrasion resistance; in fact, a Ucrete IF floor can actually increase impact and abrasion resistance because it is formulated to withstand wider temperature fluctuations and tolerate both organic and inorganic acids, alkalis and salts. UCRETE flooring solutions have been tested for comprehensive, flexural and tensile strength, elasticity, thermal expansion and conductivity, water absorption and resistance to bacterial and fungal growth. To help in choosing which quality UCRETE® solution best fits the needs of your facility, consult the UCRETE Physical and Mechanical Properties Chart, a comparison of UCRETE® HF, UCRETE® HP and HP/Q, UCRETE® MF and UCRETE® WR that details the properties of each product based on the testing method used. 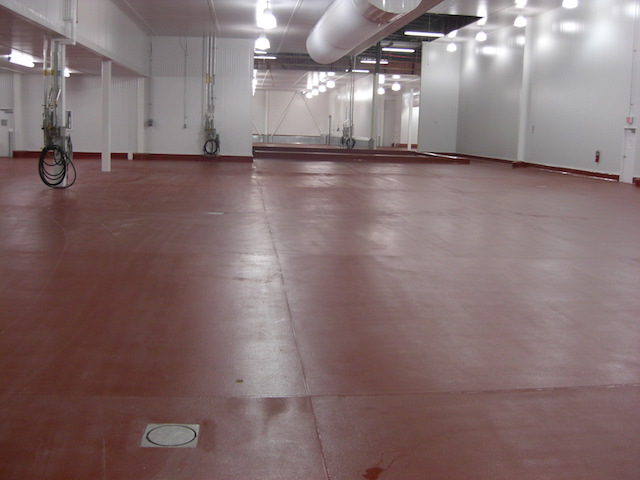 UCRETE®‘s strength and durability are well-known throughout the industrial flooring industry. The seamless systems withstand thermal expansion conditions by mimicking the movement of concrete. Thermal cycling tends to stress the adhesive bond, weakening its strength, which can lead to delamination in most epoxy resinous flooring systems. By comparison, UCRETE® maintains a consistent bond with concrete regardless of extreme physical conditions, outperforming other flooring surfaces. To complement the existing architectural styling of your facility or coordinate with your company branding, each UCRETE® polyurethane concrete system is available in a variety of colors, including green, red, cream, gray, charcoal, blue and black. To assure exact color match, make final approvals from physical samples. The color of the installed UCRETE® flooring may darken or change under exposure to UV light; however, product performance will not be affected. Surface Solutions is a Master Contractor of UCRETE® flooring solutions, providing expert consultation and installation, and a full line of UCRETE® products in addition to other industrial flooring systems. We are committed to 100% customer satisfaction on every project.